Rosemary is one of my favorite prenosologic cultures of the Mediterranean region. Italian cooks are very often sprinkled on bruschetta, and the famous sandwiches - Panini. We usually buy a rosemary in dried form, but it is not so difficult to grow at home and to always have on hand. Pot, soil, fertilizer, seeds, water, watering can. Buy container in which to grow rosemary. It is better to give preference to the classic clay pot. Try to avoid plastic. The size of the container must be sufficient so that it could accommodate the root system of a small Bush the size of 30-50 cm. Mix garden soil with rotted manure, make 3-5 g of superphosphate, 6-7 g of nitrogenous fertilizers and 3-4 grams of potassium nitrate per kilogram of soil. Liberally pour. Visivite seeds of rosemary on the surface of the earth. Do not sprinkle. Pull the pot plastic wrap. Make a small hole for air circulation. Do not remove the tape for about a week, then you can test how seeds germinate and grow. Unfortunately, germination from rosemary is quite low, so it is possible that the sowing must be repeated. The control moment should be a period of 3 weeks. If seeds have not germinated – plant again. To thin out the seedlings at the stage of second or third true leaf. Carefully remove the excess plants and transplant them to places where seeds did not germinate. Better to pour a watering can with water divider. You can use a household sprayer. A strong jet might damage the seedlings. Feed solution "Ideal" or other organic fertilizer when rosemary will grow to 5-8 cm For the 1 tbsp. of fertilizer dissolve in 0.5 l of water and slowly pour under a Bush. Definitely proryhlit small garden fork, not venturing more than 2-3 cm in order to improve the access of oxygen to the roots, that depth is sufficient. Ensure grown home rosemary to receive the necessary amount of sun. Without sunlight your plant will slowly grow, its stems become thickened and brittle and the leaves will soon begin to fall. If possible in the warm time of the year to make Bush "breathe" on the balcony. If there is no balcony – open window. 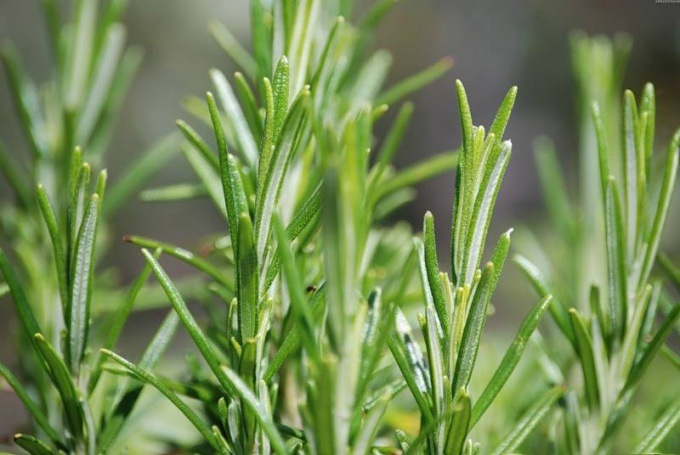 Cut the first shoots of rosemary, when the plant reaches 10-15 cm, and branches lightly will begin to stiffen. This pranotthana aromatic culture is essential for both Italian and French cuisine. Russian Housewives like to add it to stews, vegetable casseroles, stuffings. Don't overlook rosemary canning vegetables. If the container intended for growing rosemary be too little, the plant is not enough nutrients and it will die. Grow rosemary in the window, facing South. This plant loves the sun. Rosemary as spice began to use a very long time. Thanks to its healing properties, this fragrant herb rather quickly became widespread. This evergreen plant will not only benefit your health, but also perfectly decorate the area. You can try to grow rosemary at his dacha. The leaves of this spicy grass abound in essential oils, vapours which when inhaled, irritate the receptors of the nasal cavity and transmit information in the brain, positively affecting the emotional state. In addition, the smell of rosemary helps enhance memory, returns vigor, reduces physical tension, strengthens the nervous system. Also, this spices will be a spicy zest to many dishes. The leaves of the rosemary perfectly complement both fish and meat dishes. In addition, rosemary perfectly complement your site. Containers with this plant to heighten the flavor you can put next to the gazebo, decorative pond or a bench to relax. The rosemary is the perfect southern climate, however, if desired, it can be grown in the Central part of Russia. But this spice does not tolerate cold, so in winter months it needs special cover. Rosemary does not tolerate waterlogged soil, but likes a shady place. Here it is necessary to adhere "Golden mean". 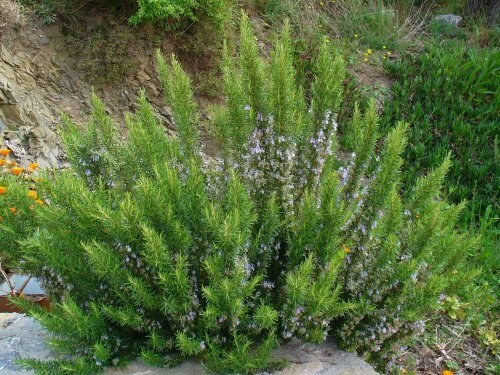 If rosemary would stand in a too shady place, it will lead to lowering of the education in its leaves essential oils. The best option is to grow it in containers with really good drainage. If necessary, the potted plant can be moved to locations with optimum light. Over-watering rosemary can provoke falling of leaves, and the lack of moisture – they are yellowing. You must ensure that the ground under the plant is quite well dried out and was not overly dry. If we talk about the soil, the rosemary does not tolerate acidic soils. He is fine and growing on calcareous soils with excellent aeration. Good option – rubbly and sandy soils. Care rosemary comes to the timely tilling of the soil, weed removal and fertilization. In summer, this spice should feed every 15 days mineral fertilizer, particularly nitrogen. Closer to the fall you need to fertilize with a predominance of phosphorus. Rosemary is also in need of pruning. It needs to be in the middle of spring. By lowering the temperature to 10-12 degrees rosemary requires shelter. Similar to the temperature in the middle zone of Russia is established by the beginning of September, so rosemary is best grown in pots. In winter the plant should be kept indoors at a temperature of 10-13 degrees, otherwise later it will not please flowering. Rosemary is a perennial ornamental plant. Used as spices and seasonings when cooking vegetables, meat and fish dishes, tomato and cream sauces, fruit salads, etc. Rosemary can grow in the open ground. Though the winter in Central Russia is hardly possible. The plant is propagated vegetatively or by seeds. 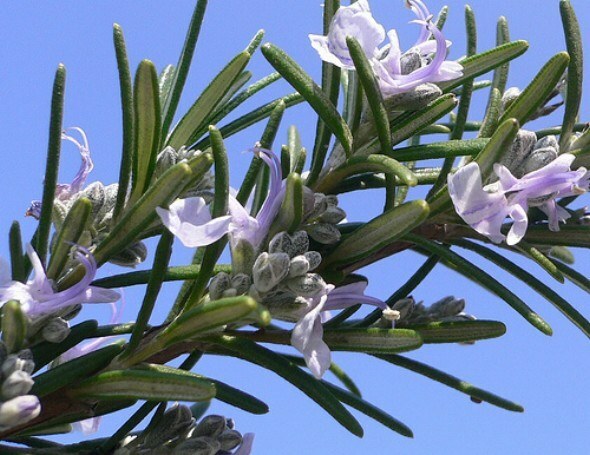 Rosemary is a heat – loving and photophilous polukustarnikovoe a plant. It is best propagated by cuttings, but you can grow it from seed. He does not like acidic soil, it prefers loose limy, absolutely not tolerate waterlogging. The Mature plant is highly resistant to diseases and pests. Seeds seedlings are best planted in February–March. Please be patient, as they germinate very long time. Before planting, soak the seeds for several days in warm water. It will improve germination. It is important, however, that the water was just warm not hot – in this case simply nothing will grow. Soil for planting should be light and nutritious. You can just buy the appropriate soil mix in the store. Not sealed the seeds deep into the soil. Cover the planting container with glass or build a small greenhouse. Daily ventilate. Water by spraying and do not allow overflows – this can lead to rotting of seeds and their destruction. When the seeds sprout, ventilate the greenhouse in warm, Sunny days, the plants do not feel temperature difference. Drafts are unacceptable. Small shoots of rosemary should be gradually accustomed to the ambient temperature. Start with 2-3 hours. It is advisable to transplant the young plant was already seasoned enough to continue to grow outside the greenhouse. If you plan to grow rosemary at home, it should be transplanted when the seedlings reach a height of 10 cm By this time the seedlings are somewhat slow to grow. Transplant better method of handling not to disturb the earth com. Provide good drainage. Pour the plant, the next 2-3 days to water should not be. Put the pot in a dark place. When you're sure that the Bush has taken root, place it on a well-lit windowsill. If you are planning to plant seedlings in open ground, 25-30 days after germination, her dive into individual pots, and with the onset of heat drop.